A phobia is a persistent and excessive fear of a specific stimulus, such as a thunderstorm. Immediate, excessive anxiety response is characteristic of a phobic condition, and it has been suggested that once a phobic event has been experienced, any event associated with it, or the memory of it, is sufficient enough to generate a response. The most common phobias are associated with noises (such as thunderstorms or fireworks). Fear is the instinctual feeling of apprehension resulting from a situation, person, or object that appears to present an external threat — whether real or perceived. The response of the autonomic nervous system prepares the body for the freeze, fight, or flight syndrome. It is considered to be a normal behavior, essential for adaptation and survival; its context determines whether the fear response is normal, or abnormal and inappropriate. Most abnormal reactions are learned and can be unlearned with gradual exposure. Anxiety is the anticipation of future dangers from unknown or imagined origins that result in normal body reactions (known as physiologic reactions) associated with fear; most common visible behaviors are elimination (urination and/or passage of bowel movements), destruction, and excessive vocalization (barking, crying). Separation anxiety is the most common specific anxiety in companion animals. When alone, the animal exhibits anxiety or excessive distress behaviors. Most fears, phobias, and anxieties develop at the onset of social maturity, from 12 to 36 months of age. A profound form of fear and withdrawal of unknown cause often occurs around eight to ten months of age. Old-age-onset separation anxiety of unknown cause may be a variant of a decline in thinking, learning, and memory in elderly pets. Panic: Signs may include active escape behavior, and increased, out-of-context, potentially injurious motor activity. Your veterinarian will first want to rule out other conditions that might be causing your cat’s behavior, such as brain or thyroid disease. The behavior could also be originating from a response to a toxic substance, such as lead, which can cause neurological disorders. Blood tests will rule out or confirm such a possibility. If your veterinarian diagnoses a simple fear, anxiety, or phobia, a prescribed medication may be all that is needed. But your doctor will most likely make recommendations based on your individual cat, what the fear trigger is, and how you can alleviate your cat’s fears and anxieties through behavioral conditioning. If your cat has extreme panic and separation anxiety and needs to be protected until medications can become effective, which can take from days to weeks, hospitalization may be the best choice. Otherwise, you will need to care for your cat at home, and will need to provide protection from self inflicted physical injury until the cat calms down. If you are unable to stay at home with your cat, you may need to arrange for day-care or cat-sitting. Affected cats will respond to some degree to a combination of behavior modification and treatment with anti-anxiety medication. If there is a condition that causes itchiness and/or pain that is exacerbating the anxiety, it must be controlled. Your cat may need to live in a protected environment with as few social stressors as possible. These animals do not do well in competitive shows. Behavior modification will be up to you. You will need to teach your cat to relax in a variety of environmental settings. 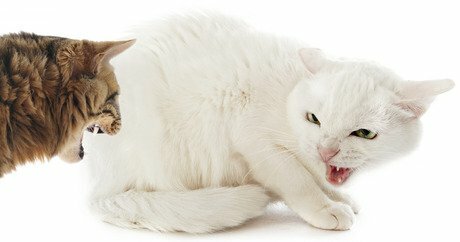 Avoid reassuring the cat when it is in the midst of experiencing fear or panic; the cat may interpret this as a reward for its behavior and continue to repeat the behavior. Encourage calmness, but do not reinforce the fear reaction. Remember that not all cats will calm down when crated; some will panic when caged and will injure themselves if forced to be confined, biting or scratching at the cage until they have torn nails or broken teeth. Absolutely avoid punishment for behavior related to fear, phobia, or anxiety, as this will only increase the fear response. Desensitization and counter-conditioning are most effective if the fear, phobia, or anxiety is treated early. The goal is to decrease the reaction to a specific stimulus (such as being left alone in the dark). Desensitization is the repeated, controlled exposure to the stimulus that usually causes a fearful or anxious response in such a way that the cat does not respond with the undesirable response. With repeated efforts, the goal is to decrease the cat’s undesirable response. Counter-conditioning involves training the cat to perform a positive behavior in place of the negative behavior (in this case, fear or anxiety). For example, teach your cat to sit and stay in the same place, and when your dog responds appropriately you can reward it appropriately with a small treat and a comforting pat. Then, when your cat is in a situation where it has previously shown the undesirable response, have it sit and stay. The signs involved in an oncoming anxiety attack are subtle; learn to recognize the physical signs associated with the fears, phobias, and anxieties and head the behavior off before it has a chance to take over your cat’s behavior. As long as your cat is on medications, your veterinarian will want to follow-up by conducting occasional blood testing to make sure your cat’s blood chemicals stay in balance. If behavior modification does not work over the long-term, your veterinarian may want to modify the approach. If left untreated, these disorders are likely to progress. Most treatment will be long-term, possibly years, with the treatment duration depending on the number and intensity of symptoms and how long the condition has been going on. Minimum treatment averages four to six months.